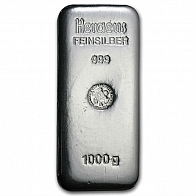 Buy Heraeus silver bullion bars in the most popular sizes, including 1 KG silver bullion bars. Heraeus is Germany's most prominent precious metals refinery. Heraeus also owns Argor-Heraeus, located in Switzerland. 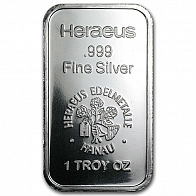 Heraeus silver bars are available for VAT-exempt Swiss storage or delivery worldwide. Bars may be purchased using bank transfer or via cryptocurrency.